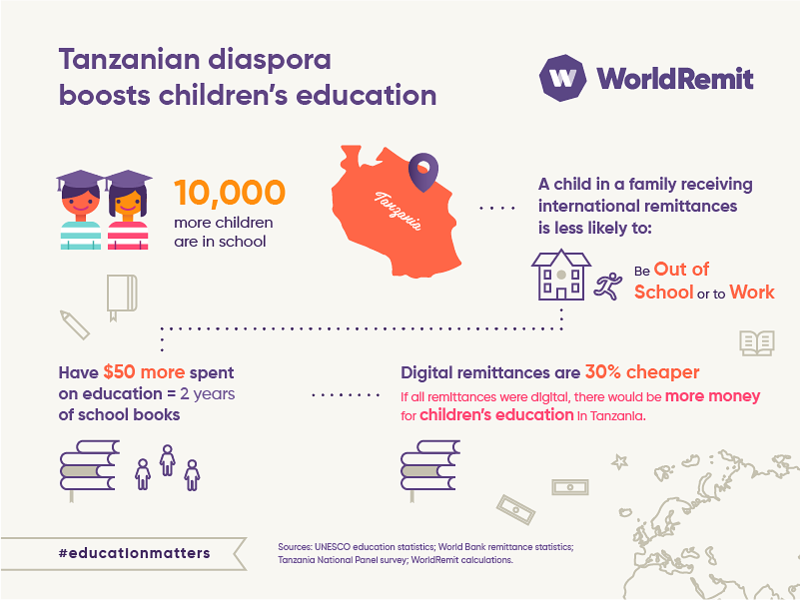 Our research shows that tens of thousands of Tanzanian children are in school due to money sent from loved ones living abroad. In the households that receive remittances, not only is more money spent on education, but the children are also less likely to work and more likely to study. In Tanzania, we found diaspora support gave 10,000 children a better chance of being in school, and the extra money available for individual children amounted to the cost of text-books for two years. At a global level, our calculations suggest that if traditional, cash-based money transfers were replaced by lower-cost digital alternatives, an additional $825 million would be unlocked for families to spend on children’s education. Such savings could be enough to pay for 20 million school uniforms, 30 million school books and 16 million sets of school supplies for children in low and middle income countries. For full methodology see here.